The World Club Series started on Friday and went through all the way to Sunday, these are the highlights of all 3 games. The game was fast moving with the Illawarra Dragons scoring 2 minutes in but not long after on the thirteen minute mark O'Brien scores and kicks level for the English side. St. George went ahead soon after, it was Thompson with the try and Giddop converted in the 19th minute! The half time score was twelve points to six on the behalf of St. George with bothe sides scoring and converting in the second half. Atkins got the try that sent the Wolves level but before the end Dugan slaughtered the Wolves to seal a 6 point gap, winning eighteen points to twelve in the first game. Giddop converted all 3 goals for St. George with O'Brien kicking just the two for Warrington. The game got off very slowly when the try took 7 minutes to bring the game alive. McCullough scored first with Parker converting for the Broncos but shortly after Wigan Prop, Farrell scored the try with Smith Converting for the Home side. At half time and the sides were six apiece but after the break the Broncos got the try with Parker converting again. Burgess scored a minute from time and Smith kicked the goal but at 12 - 12, the Broncos star man Parker converted a 2 point penalty to take the game to, Wigan 12 - 14 Broncos and that was it, the golden points went to Brisbane the Aussies were 2 - 0 up over the English and won country wise. Find out next to see who won the final. The Final kicked off earlier than eight at seven between the Super League and NRL Champions but the Saints were getting outdone when Stewart, Walker, Inglis and Reddy scored all in one half with all of the kicks converted by Reynolds! At half time the Rabbitohs were 24 points ahead of the Saints but after the game restarted for the second half the score got upgraded by 4 to 28 and Reynolds converted again to give South Sydney a 30 - 0 Advantage. McQueen assured a South Sydney win but the converted attempt missed by a centimetre, Reynolds kciked for one and it was then thirty nine nil to the Rabbitohs. That was it Full Time at Langtree park and the South Sydney Rabbitohs are Rugby League Champions! 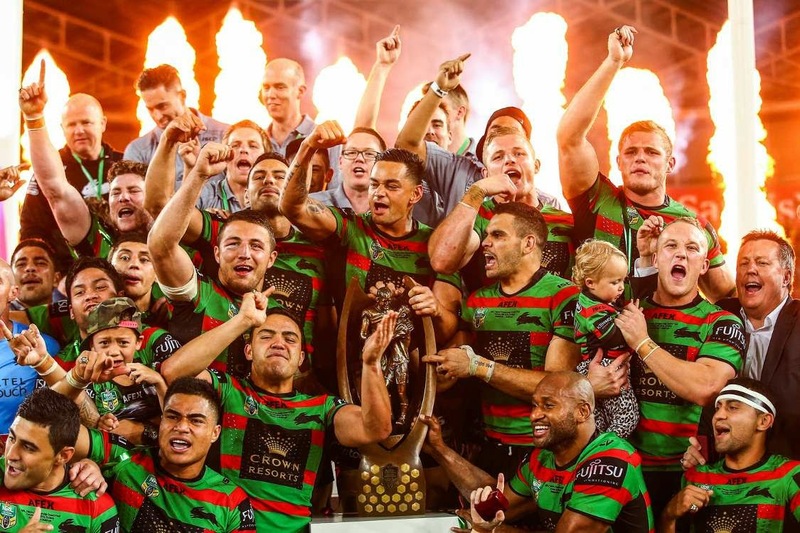 The South Sydney Rabbitohs thwarted the Saints out of the final inside 30 minutes when the score was an impressive 24 nil and Wigan lost to the Broncos and the Warrington Wolves got beaten by St. George Illwarra Dragons. The Rugby League World Club Series on TSM from the 20th until the 22nd of February 2015.